The Post Office have a motto, something like "neither snow nor rain nor heat nor gloom". Well, that could easily apply to our bride and groom Amanda and Mike who took it to the rain on their Spring wedding day. You will see them brave the elements later in this post with their awesome pink and black umbrella. They rocked it. Our day started with bridal prep at Amanda's parent's house with a lovely gift from daughter to mom on display. Family love was everywhere in the house as I photographed Amanda's wedding day accessories in her childhood bedroom. Bridal prep in Highland, Indiana. Bride in the window of her parent's home. Just before she walked down the aisle I visited Amanda in one of the classrooms at the church. I cajoled her into writing all of the bridesmaids names in hearts and we took a quick picture. Fun bridesmaids photo with hearts on a chalkboard. The ceremony was at St. James the Less Catholic Church in Highland and had many emotional moments and culminated with celebratory bubbles. 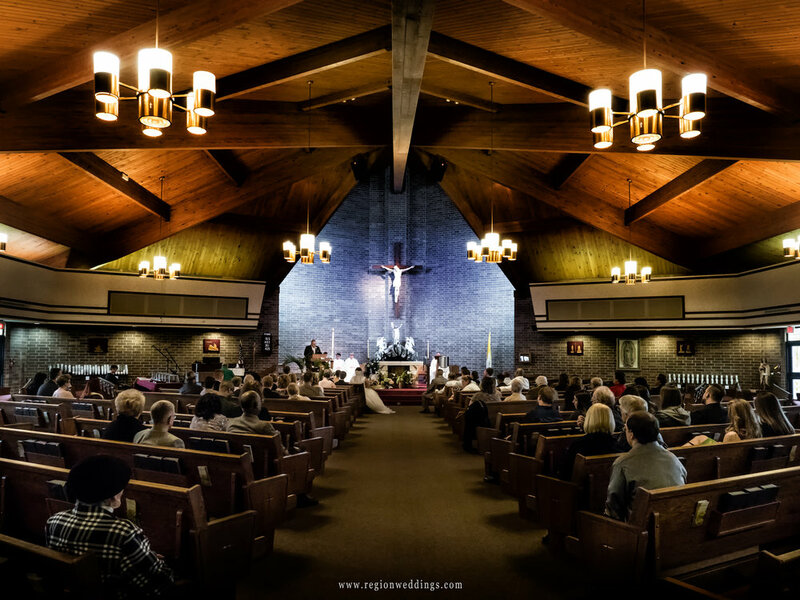 Catholic wedding ceremony at St. James in Highland, Indiana. I loved the expression of the newlyweds after the ceremony when I photographed them in front of the stained glass windows. After family pictures, we photographed the wedding party as well as the couple all around the church and then it was off to Centennial Park for a romantic walk in the rain. Bride and groom have a laugh. 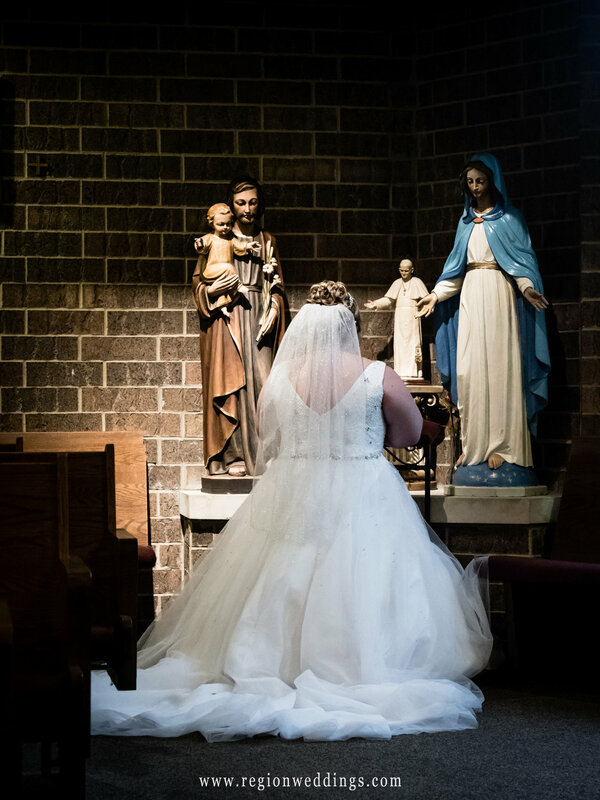 Beautiful bride on the altar at St. James the Less Catholic Church. Not only is rain good luck on wedding day, but it also provided nice saturated colors for wedding photos!! 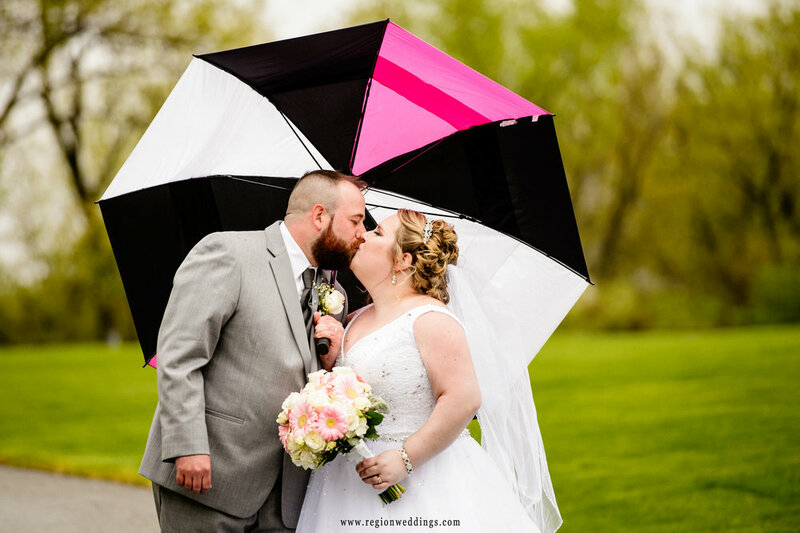 Bride and groom underneath a pink and black umbrella. Bride and groom take a romantic walk in the rain at Centennial Park. The groom leans against the wall of the amphitheater at Centennial Park. 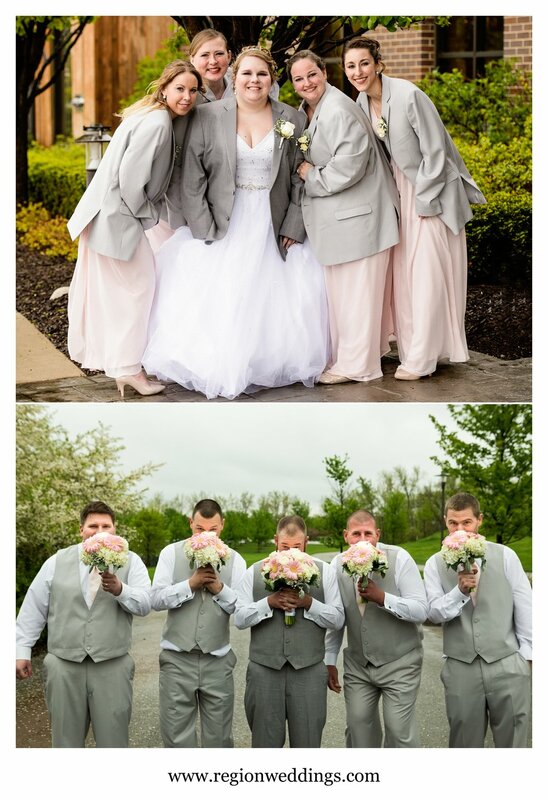 The bridesmaids didn't seem to mind when I suggested they wear the groomsmen's jackets for some outside shots as the temperatures dropped. Fun wedding party photos at Centennial Park. 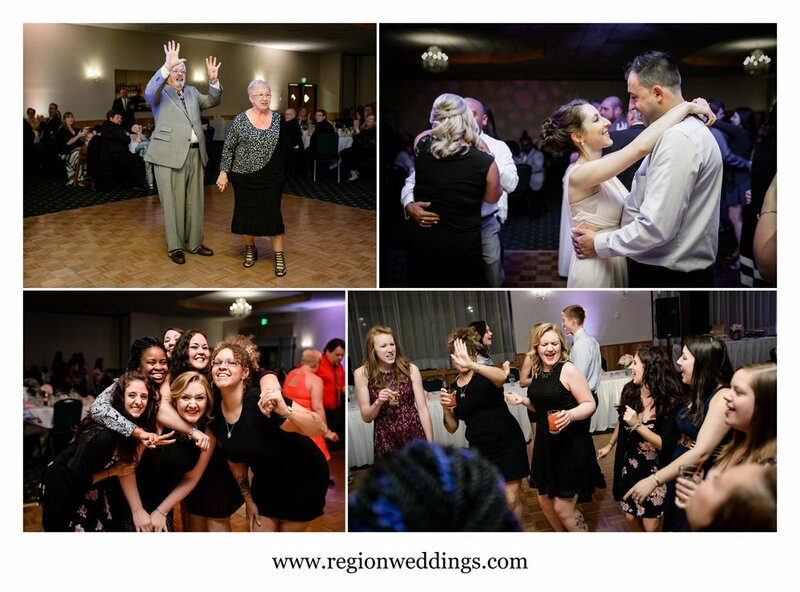 The reception at The Patrician in Schererville was a lot of fun with lot's of nice decor and a room full of laughter. After dinner it was time for the first dances and then the 27 Entertainment crew cranked up the jams. Reception decorations at The Patrician. Father daughter and Mother daughter dances at The Patrician. 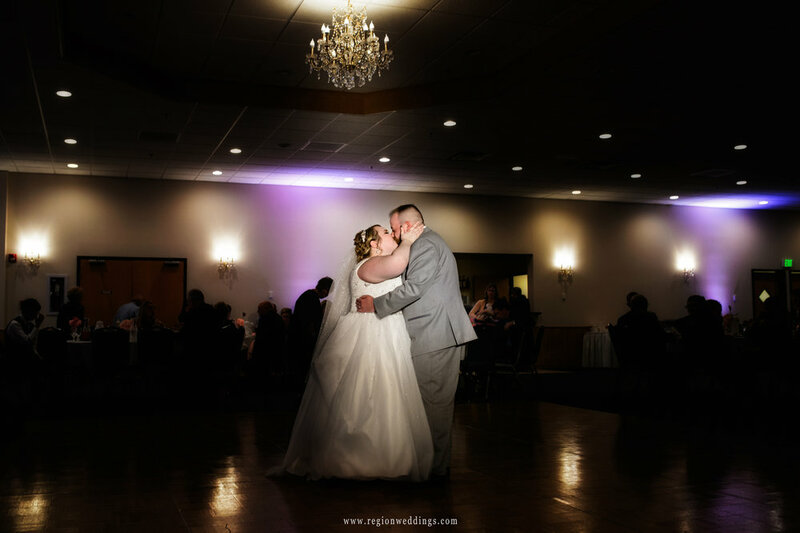 First dance for the bride and groom at their Spring wedding at The Patrician. The couple married the longest clocked in at 54 years!! Wedding reception fun at The Patrician. 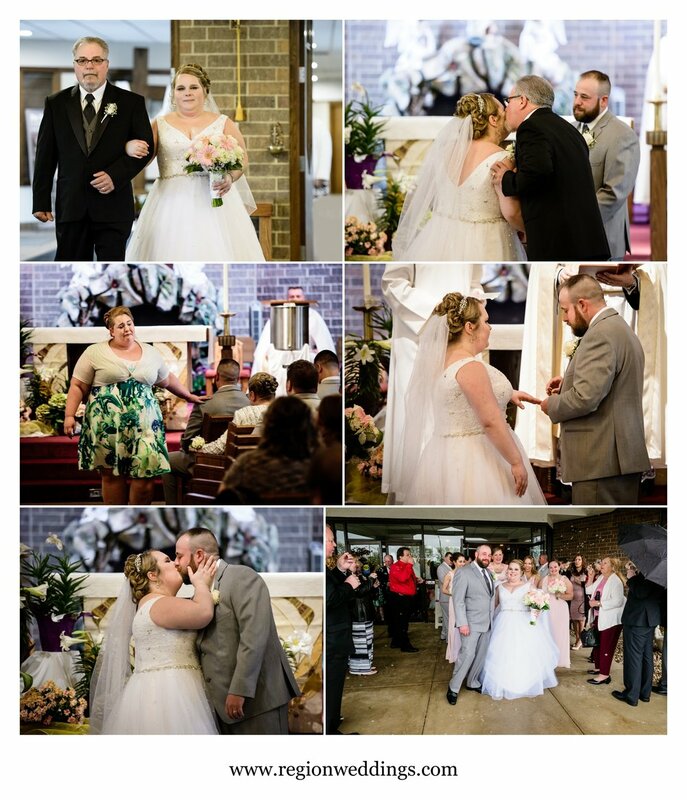 This has been a sneak peek look at Amanda and Mike's Spring wedding at Saint James the Less Catholic Church in Highland, Indiana. Many more images to come, so stay tuned!! As always, inquire about your big day via the Contact Form. Happy Spring! !